I’ve played along with Karen Giron’s Sweet Sunday Sketch Challenge 58 today for my friend’s little one’s 4th birthday.. I began with Brilliant Blue Cardstock, Tangerine Tango and Whisper White. I punched scallop circles in each colour and created a base for my three cupcakes, stacking them up on dimensionals. My cupcakes are from Party Hearty – stamped in Kiwi Kiss and Pacific Point. The four candles are stamped in Only Orange. Each cupcake is cut out and popped up on even more dimensionals for some serious height! My really sweet Happy Birthday sentiment is from the FREE sale-a-bration set Happy Moments and I have punched it out with my word window punch and popped it onto dimensionals. 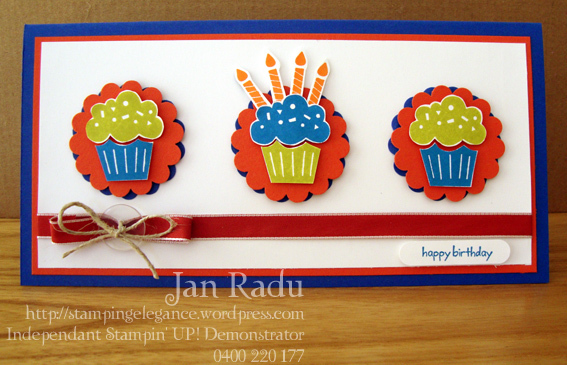 I just don’t use this stamp set enough – I love the way this card turned out – clean and simple. A fun birthday card! Love those cupcakes mounted on the Scallop Circles! I have to get my Party Hearty stamp set out more often too! Love the clean & simple look!